Augusta, ME - The Maine Center for Disease Control and Prevention (Maine CDC) is warning Mainers of a flyer appearing to come from the federal Center for Disease Control. 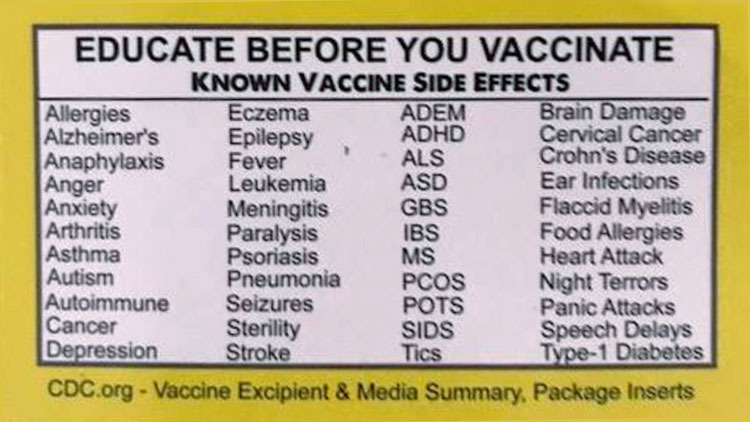 The flyer claims to outline a list of "known vaccine side effects" without providing references or citing any sources. Additionally, the website listed as CDC.org is not an active website, nor is it supported by the federal CDC. The flyers are known to have been circulating through big box stores in Southern Maine. Be advised that these flyers were not issued or endorsed by the Maine CDC or federal CDC.